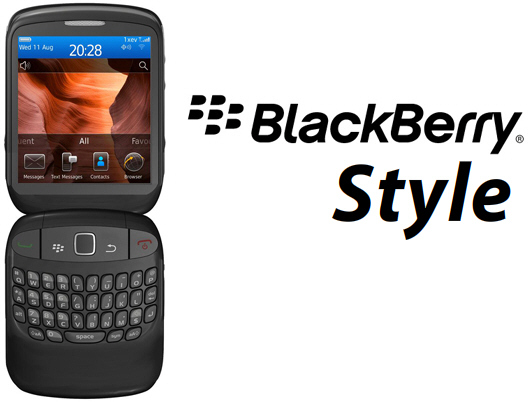 BlackBerry 9670 clamshell to be branded the BlackBerry Style! You heard it here first... the upcoming BB flip is the BlackBerry Style! Been wondering what product family Research in Motion was going to slot the upcoming BlackBerry 9670 clamshell into? Could it be a Pearl? Maybe a member of the Curve family? Nope. We've confirmed with multiple sources now that the new BlackBerry 6 toting flip is getting a new product family name of its own. Enter the BlackBerry Style. I guess consumers who go for a flip phone these days do have a particular sense of style, so maybe the BlackBerry Style name is a fitting one. With a name like Style we may see a ton of consumer and fashion focused BlackBerry Style Cases and BlackBerry Style Accessories emerge too. So what do you think of the name? Like it? Love it? Hate it? I always find when I first hear the name of a new BlackBerry I don't like it overly much... but then it grows on you, and it just sticks. I think that's likely to be the case here too. Let us know what you think in the comments!